these, from my mom's kitchen. They are totally addictive. Taste buds really do love a kick of flavor and heat. When I prepare them, I add a tablespoon of turmeric powder and boil on. So yum! A traditional method of boiling peanuts took 4 to 5 hours, but boiling them in instant pot is now a quicker and easier process, it needs just 40 minutes. When prepared correctly, they really are a treat, not to mention sneaky addictive. 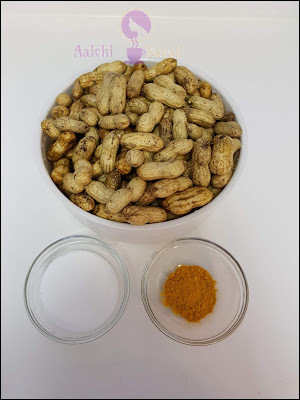 I have used raw or green peanuts, you can use dry one, but fully mature peanuts do not make good quality boiled peanuts, preferably raw or green ones are. So let's start. Dietary Comments: Healthy snack, vegan, gluten-free. Water as needed to cover the peanuts. 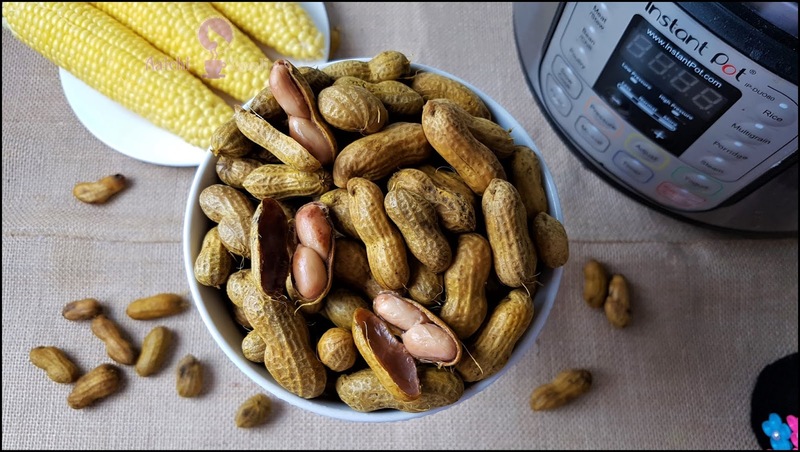 Rinse the peanuts under tap water to remove any debris. To the instant pot, add water, salt, and turmeric powder and stir it. Now add peanuts in the pot and add enough water to cover the peanuts and stir. Peanuts will float, so I have placed plate/weight on top of them to keep them submerged. Close the lid and place the vent in sealing position and cook on high pressure for 40 minutes. When done, NPR for 10 minutes and then release remaining pressure manually. 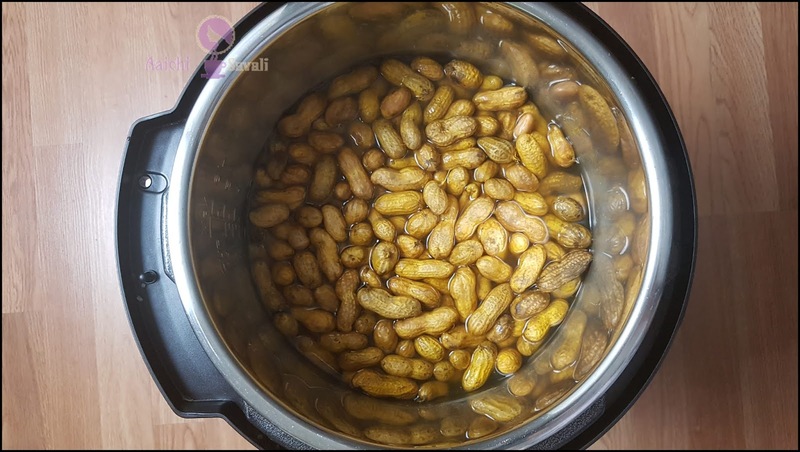 Tadaa, Boiled Peanuts are ready to serve. Enjoy!!! If you don't have a small plate, then you can place trivet that came with IP and on top of trivet place any Pyrex bowl, heatproof bowl/mug should work, to keep it weighted down. Be sure to not overfill the Instant Pot. If you like you can add seasoning of your choice. If you are using dry peanuts / fully mature peanuts, then cooking time will increase (may need to cook for 60-70 my minutes on high-pressure manual mode). Drain the peanuts and store in a covered container in the refrigerator for up to 1 week. The cooking time can vary greatly depending on how fresh the peanuts are. The fresher the peanut, the less time it will take to cook. Nutrients: Peanuts contain vitamins, minerals, nutrients and antioxidants and thus are rich energy sources. Fertility: If taken before and during early pregnancy, the folic acid lowers the risk of a baby being born with serious neural tube defects. Regulates Blood Sugar: Manganese in peanuts helps in calcium absorption, fats and carbohydrates metabolism and sugar level regulation in blood. Lowers Cholesterol: Peanuts contain monounsaturated fatty acids especially oleic acid that prevents coronary diseases. It lowers bad cholesterol and increases good cholesterol in the body. 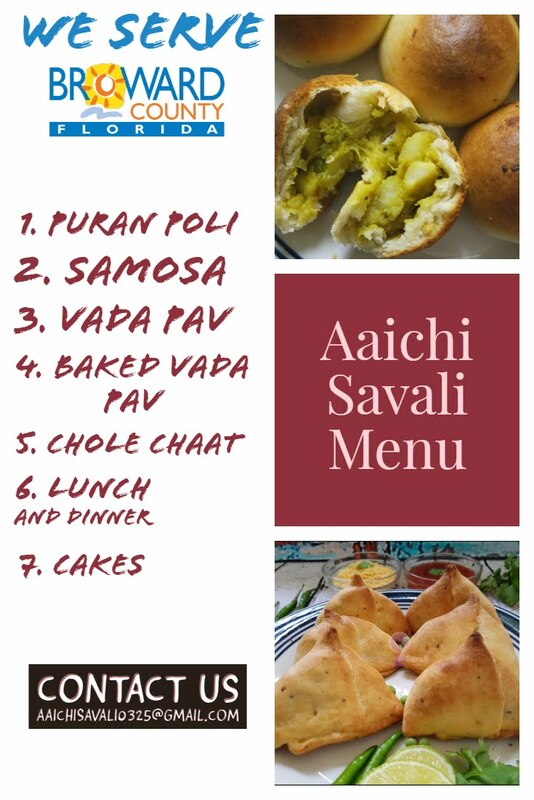 You are welcome Pushpendra. Good to know that you liked it.